Are you ready for our Christmas Advent Calendar? Monday 30th November 2015 – 8.10pm – Murray MacGregor. As the festive celebrations prepare to get into full swing, our emergency ambulance staff have busy been writing their Christmas lists for Santa Claus. As they know only too well, they’re likely to come across a huge range of medical emergencies over the festive period. This year, their lists for Father Christmas are concentrating on what you can do to help yourself, your family and our staff. Together we’ll be opening a new door on our advent calender each day with our staff letting you in on their hints, tips and wishes in the run up to Christmas Day. WMAS Assistant Chief Ambulance Officer, Steve Wheaton, said: “We’re hoping that everyone has a fantastic Christmas this year. By following our simple tips and hints, you can help yourself to make sure that it really is a special time of year. The 999 Advent Calendar is launched on Tuesday 1st December and will run until Christmas Eve. To access the videos just go to our website or follow us on Twitter, Facebook or Instagram – search for ‘officialWMAS’. West Midlands Ambulance Service would like to take this opportunity to wish everyone a very Happy Christmas and prosperous New Year. Monday 30th November 2015 – 4.30pm – Claire Brown. We joined forces with colleagues from the Welsh Ambulance Service to provide advanced trauma care to a teenager and a young boy injured in an RTC this afternoon. West Midlands Ambulance Service was called to reports of a car which had collided with a tree in Burma Road, Park Hall, Oswestry shortly after 3.15pm (Monday). An ambulance, two senior paramedic officers and the Midlands Air Ambulance from Tatenhill were sent to the scene. The Welsh Ambulance Service also sent an ambulance, medics from a local hospital and the Wales Air Ambulance. A West Midlands Ambulance Service spokeswoman said: “The car had left the road and collided with a large oak tree, causing significant damage to the car. The passenger, a seven-year-old boy, had managed to get himself out of the wreckage before the emergency services arrived but the driver was trapped inside. “Upon assessment by ambulance staff, the young boy was found to have suffered facial injuries and multiple fractures to his leg. He was given strong pain relief as well as a drug to prevent blood loss. Once stable, the boy was transferred to the awaiting Midlands Air Ambulance before being airlifted to Birmingham Children’s Hospital for further specialist trauma care. “The driver, a 19-year-old man, sustained significant leg fractures. Whilst ambulance staff and the medics immobilised the man and administered various trauma drugs to help stabilise his condition, the fire service worked carefully around the team to release the man from the wreckage. After around 40 minutes, the delicate operation was complete and fire and ambulance staff were able to carefully lift the man out of the car and onto a spinal board. Notes to Editor – please credit West Midlands Ambulance Service if photograph is used. Monday 30th November 2015 – 3.15pm – Claire Brown. An elderly man and woman have been injured after their car collided with railings in Shropshire this afternoon. The incident happened on the A49 in Church Stretton just before 1.00pm (Monday). An ambulance, en route to hospital with a patient on board, came across the incident and stopped to render aid until two further ambulances, a paramedic area support and the Midlands Air Ambulance from Cosford with a MERIT trauma doctor on board arrived on scene. A West Midlands Ambulance Service spokeswoman said: “The car had reportedly collided with metal railings leaving both the driver and passenger trapped in the wreckage. “The driver, a 70-year-old man, was assessed by ambulance staff and was found to have head and chest injuries. The passenger, a woman in her 60s, sustained chest and abdominal injuries. Whilst ambulance staff and the doctor administered oxygen to the man and pain relief to the woman, the fire service worked around them to carefully cut the occupants out of the car. Both the man and the woman were extricated from the car onto a spinal board to immobilise them. Monday 30th November 2015 – 8.55am – Claire Brown. Emergency Services were at the scene of a serious RTC earlier this morning which left one man trapped in an upside down car. West Midlands Ambulance Service was called to the B4027 near to Coombe Abbey in Warwickshire at 6.40am this morning (Monday). Two ambulances and a paramedic area support officer attended along with two doctors from the Warwickshire and Northamptonshire Air Ambulance base who made their way to the scene by car. A West Midlands Ambulance Service spokeswoman said: “Crews arrived to find a single car which had left the road and had landed upside down in amongst trees and hedges at the side of the road. “The driver, a 30-year-old man, was trapped in the wreckage and was initially unconscious. The fire service and ambulance staff worked quickly to release the man from the car by cutting away parts of the car which, in itself, was a difficult task due to the amount of branches in their way. “Once released and clear from the car the man regained consciousness but it was clear to ambulance staff that he had sustained a serious head injury. The doctors took the decision to anaesthetise him on scene in an attempt to stabilise his condition. The man was then taken by land ambulance on blue lights to University Hospital Coventry and Warwickshire. Medics in A&E were pre alerted to the arrival of the man who was said to be in a critical condition. Sunday 29th November 2015 – 10.30pm – Chris Kowalik. A man has died following a collision with a car in Stourbridge. West Midlands Ambulance Service was called to Brettell Lane shortly before 6.50pm today. A senior paramedic officer in a rapid response vehicle, an advanced community paramedic in a rapid response vehicle, an ambulance and the Medical Emergency Response Incident Team (MERIT) consisting of a trauma doctor and critical care practitioner attended. Sunday 29th November 2015 – 1.20pm – Chris Kowalik. There were two badly damaged cars but fortunately no serious injuries after a crash in Cannock this morning. West Midlands Ambulance Service was called to Orbital Way shortly after 11.05am today. Two paramedic area support officers attended in rapid response vehicles and two ambulance crews attended. The Midlands Air Ambulances from Cosford and Staffordshire were assigned but stood down before arrival. Saturday 28th November 2015 – 7.45pm – Jamie Arrowsmith. A woman has been rescued from a hillside after falling and suffering a leg injury this afternoon. West Midlands Ambulance Service was called to the Malvern Hills just after 2.15pm and sent an ambulance, a community paramedic in a rapid response vehicle, a paramedic area support officer and the Trust’s Hazardous Area Response Team to the scene. A West Midlands Ambulance Service spokesman said: “The woman, thought to be in her 50s, had fallen whilst walking on the Malvern Hills, approximately half-a-mile from the British Camp car park. “She was assessed and treated for a lower leg injury, had her leg immobilised and was given pain relief by ambulance staff. “The difficulty was getting her back down to the ambulance. Crews worked closely with the fire service who provided their specialist off-road vehicle in order to complete the rescue. “The woman was carefully moved on to the vehicle before being taken down the side of the hill and to the awaiting ambulance. An incredible dose of good fortune ensured no one suffered any injuries when a car went through the window of a hairdressers earlier today. The incident happened on Lawnswood Road in Wordsley, Stourbridge, shortly before 11.50am and West Midlands Ambulance Service sent an ambulance and a paramedic area support officer to the scene. A West Midlands Ambulance Service spokesman said: “Quite how no one suffered any injuries in this incident is not far short of a miracle. “The car came to rest almost completely in the hairdressers which had a number of people inside at the time. “Thankfully, none of them were caught up in the incident. “The driver of the car, an elderly woman, managed to free herself from the vehicle and following assessment from ambulance crews she was discharged at the scene. Saturday 28th November 2015 – 7.45am – Jamie Arrowsmith. Two men have been incredibly lucky to avoid serious injuries when their car left the road and ended up in a ditch last night (Friday). West Midlands Ambulance Service was called to Somers Road in Meriden, Coventry, near to Stonebridge Golf Centre, shortly after 8.05pm and sent an ambulance and a paramedic area support officer to the scene. A West Midlands Ambulance Service spokesman said: “Crews arrived to find a car in a ditch with two male patients inside. There was heavy rain and a lot of water on the ground when ambulance staff arrived. “The two men managed to free themselves from the vehicle and following assessment from crews, thankfully it was determined they had not suffered any serious injuries. “Not only is it extremely fortunate that both men escaped with minor injuries, but also that they were both able to free themselves from the vehicle. If used, please credit the image to West Midlands Ambulance Service. Friday 27th November 2015 – 11pm – Jamie Arrowsmith. A pedestrian who collided with a van was dragged from underneath it by bystanders earlier this evening. The man, thought to be in his 70s, suffered a serious leg injury in the incident. West Midlands Ambulance Service was called to the junction of Oaklands Road and Lea Road in Wolverhampton just before 4.40pm and sent an ambulance, a paramedic area support officer, a community paramedic and the Midlands Air Ambulance crew from Cosford in a rapid response vehicle to the scene. A West Midlands Ambulance Service spokesman said: “On arrival, crews discovered a man who had been dragged from underneath the van following a collision between the two. “He was treated for a serious leg injury but thankfully appeared to have escaped any other injuries and remained breathing and conscious throughout. A refuse collector is fortunate to escape serious injury after a car was in collision with his bin lorry in Birmingham earlier this morning. West Midlands Ambulance Service was called to Church Lane, Handsworth at just before 7am. Two ambulances together with a paramedic support officer in a rapid response car attended the scene. A West Midlands Ambulance Service spokesman said: “Crews treated a man in his thirties who was collecting waste bins when a car collided with his refuse lorry. “The patient was treated for chest, abdominal and hip pain. Crews immobilised the patient with the use of a neck collar and spinal board. He was also given pain relief before being taken to Sandwell General Hospital for further assessment and treatment. Two pupils from a primary school in Worcester were so inspired by a lesson in CPR from a local paramedic, they decided to make their own film! Two men have been taken to hospital as a precaution following a serious fire at a shop in Walsall this afternoon. West Midlands Ambulance Service was called to the incident at premises in Caldmore Green, Walsall at just before 3pm. Two ambulances, two senior paramedic officers and the Hazardous Area Response Team (HART) attended the scene. A West Midlands Ambulance Service spokesman said: “When crews arrived they found a fire which had seriously damaged a retail property in Walsall. “A man believed to be in his forties suffered superficial burns to his face and hands. A second man presented himself to ambulance staff having been overcome by smoke. “Both patients were treated at the scene by ambulance staff before they were taken to the nearby Walsall Manor Hospital for further assessment and treatment. Thursday 26th November 2015 – 11.05am – Murray MacGregor. The driver of a 4×4 pick up escaped serious injury, despite leaving a ‘bullseye’ fracture to the windscreen after a two vehicle head on collision. The crash happened opposite the turn into the car park at Millennium Woods on Pershore Road in Stoulton, Worcestershire at about 8.45am this morning (Thursday). Two ambulances and a paramedic area support officer were sent to the scene. The two critical care paramedics from the Midlands Air Ambulance at Strensham were also responded in a rapid response vehicle due to the poor weather conditions. A West Midlands Ambulance Service spokesman said: “On arrival, crews found a car and a 4×4 pick up with considerable front end damage. “Thankfully, a number of cars that had stopped due to a car waiting to turn into the car park hadn’t been damaged. “The driver of the car, a man estimated to be in his 30s, had suffered a fractured right leg. He had to be helped out of the car by ambulance staff and after treatment at the scene, was taken to Worcestershire Royal Hospital with one of the aircrew paramedics travelling with the ambulance. Thursday 26th November 2015 – 10.10am – Chris Kowalik. West Midlands Ambulance Service was called this morning to a railway station in Warwickshire where a train had pulled in with fire underneath in its carriage. A paramedic area support officer and an ambulance crew attended. Warwickshire Fire and Rescue Service and British Transport Police also attended. Wednesday 25th November 2015 – 7.25am – Chris Kowalik. A man has been badly injured in a collision with a car as he cycled home from work. West Midlands Ambulance Service was called to the A34 at Talke, Stoke-on-Trent shortly before 2.30am today. Two British Association for Immediate Care (BASICS) doctors, two ambulance crews and a paramedic area support officer attended. A West Midlands Ambulance Service spokesman said: “The man who is in his thirties had serious head and facial injuries, a collapsed lung and leg fractures. “He was anaesthetised at the scene and his airway maintained, given drugs and fluids and was immobilised. Monday 23rd November 2015 – 9pm – Chris Kowalik. A woman has been taken to a major trauma centre after the car she was driving collided with another. West Midlands Ambulance Service was called to Wixford Road, Wixford shortly after 5.05pm today. Three ambulance crews and two rapid response vehicles driven by an advanced community paramedic and a paramedic area support officer attended. A West Midlands Ambulance Service spokesman said: “The woman who is in her thirties had broken both her legs, had a broken knee and a suspected chest injury. She was trapped in her car for around 45 minutes and was freed with the help of the fire service who cut off its roof. “She was immobilised onto a spinal board and given pain relief before being taken to Queen Elizabeth Hospital Birmingham. “An 18 month old boy who was in the same car appeared to have nothing more than a cut lip, but because of the high level of damage done to both cars in the collision, he was taken to the Alexandra Hospital as a precaution. Monday 23rd November 2015 – 7.15pm – Chris Kowalik. A woman has been trapped in a car after it left a road and went down a drop of more than six feet coming to rest against the side of a house in Herefordshire this afternoon. West Midlands Ambulance Service was called to the A44 at Kington at around 3.40pm. Two ambulances, a paramedic area support officer and the Midlands Air Ambulance from Strensham attended the scene. A West Midlands Ambulance Service spokesman said: “As a 999 call was coming in to report the crash a passing ambulance came across the incident. “The car that was on its side had to be stabilised by the fire service and the driver, a woman in her seventies, received initial treatment whilst still inside it. “She was then freed from the car and treated for a shoulder injury before being taken by land ambulance to Hereford County Hospital. Monday 23rd November 2015 – 3.35pm – Chris Kowalik. A school in Worcester has become the first in the city to have all its year six pupils taught lifesaving skills. Approx. 90 children at Pitmaston Primary School in the St. Johns area of the city were taught how to do CPR and use a defibrillator. Ali said: “I was soooooo impressed! They have clearly listened and have enjoyed everything that has been taught. The kids find the sessions fun and have all commented on how easy an automated external defibrillator is to use. One young lad thanked us for making them life savers! it was so nice to hear! Monday 23rd November 2015 – 2.45pm – John Hawker. A cyclist has been found with head injuries in the Black Country this morning. A 999 call was received to Gospel End Road, Sedgley, near to Seven Stars Public House at around 11.45am. An ambulance, a paramedic officer and the Midlands Air Ambulance from Cosford attended the scene. A West Midlands Ambulance Service spokesman said: “Crews arrived to find a cyclist on the floor who had suffered a head injury. “The man, believed to be in his late 70’s, received emergency treatment from medics at the scene and his condition was stabilised. “Following treatment the man was transferred by land ambulance to Russells Hall Hospital for further treatment. We have no further details on this incident. Monday 23rd November 2015 – 12.40pm – Chris Kowalik. Volunteer lifesavers joined emergency services for a dramatic rescue demonstration during the official opening of the new fire station in Worcester. South Worcestershire Community First Responders Steve Madeley and Tim Hodges, based in Upton-upon-Severn, attended to a burns victim at a simulated house fire and explosion, watched by HRH Prince Richard, Duke of Gloucester who formally opened the new fire facility in McKenzie Way on Thursday 19th November. After the exercise, Tim and Steve had an opportunity to speak to the Duke. Steve said: “Members of the South Worcestershire team enjoy an excellent relationship with other agencies and often attend joint exercises with Hereford & Worcester Fire & Rescue Service and West Mercia Police where they take part in various scenarios including multi-casualty exercises such as night club fires and train crashes. “We also attend Hereford & Worcester Fire station open days where we carry out demonstrations for the public such as road traffic collision casualty extractions and we also train visitors in CPR and lifesaving techniques for various medical emergencies such as choking, severe bleeding etc..
Monday 23rd November 2015 – 11.05am – Chris Kowalik. A paramedic area support officer based in Hereford has received his Queen’s medal for his work to help tackle the Ebola crisis in Sierra Leone. Mark Smith was deployed at the beginning of this year. He spent six weeks at a treatment centre in Kerry Town run by the charity Save the Children. While he was there and, sweating heavily in a biohazard suit, he treated Ebola patients, or trained other volunteers in how to use the personal protective equipment so as not to catch the disease themselves. Earlier this autumn, Mark received his medal in the post. It will accompany a number of other medals including those for his involvement in two Gulf Wars. Monday 23rd November 2015 – 7.15am – Jamie Arrowsmith. Two people have been cut free from a two-car collision overnight, one of whom lost consciousness in the crash. The two patients, a man and a woman, were from the same car with both vehicles having suffered front end damage in the collision. West Midlands Ambulance Service was called to Dudley Road in Winson Green, Birmingham, at 12.55am and sent two ambulances, a paramedic area support officer and a MERIT trauma doctor to the scene. A West Midlands Ambulance Service spokesman said: “The two cars both suffered a lot of damage in the collision. “Crews discovered two patients, a man in his 50s and a woman in her 40s. “The man, who was the driver, had been knocked unconscious and was rapidly cut free from the car through the door. “He was treated for injuries to his head and mouth, immobilised and taken to Queen Elizabeth Hospital, Birmingham. “The woman was trapped for approximately 30 minutes before being freed through the roof. “She was treated for fractures to her collarbone and arm, immobilised and taken to Sandwell Hospital. Sunday 22nd November 2015 – 11.20pm – Jamie Arrowsmith. A man has suffered serious head, arm and leg injuries following a collision between his car and street furniture tonight. The man, thought to be in his 30s, had been part ejected from his car in the collision with a signpost. West Midlands Ambulance Service was called just before 10pm to Hagley Road in Edgbaston, Birmingham, opposite Morrisons supermarket. An ambulance, a rapid response paramedic, a paramedic area support officer and a MERIT trauma doctor were sent to the scene. A West Midlands Ambulance Service spokesman said: “The car had suffered significant damage in the collision and the man, who was unconscious, was hanging half out of it on arrival. “In order to completely free him parts of the interior had to be cut away. “It quickly became apparent he had suffered multiple serious injuries. As well as a significant head injury he also had fractures to both of his arms and a leg. “He was immobilised and had a pelvic binder applied before quickly being transport to the nearby Queen Elizabeth Hospital in Birmingham. “Sadly, the man’s injuries are thought to be extremely serious. Sunday 22nd November 2015 – 10.35pm – Jamie Arrowsmith. An RTC involving three cars resulted in ten patients, four of whom were children, requiring treatment from ambulance crews tonight. West Midlands Ambulance Service was called to the junction of Newton Road and Ashby Road in Burton at 5.20pm. Four ambulances, a paramedic area support officer and a community paramedic in a rapid response vehicle attended the scene. A West Midlands Ambulance Service spokesman said: “Crews arrived to find three cars that had suffered significant damage in the collision. “Thankfully all ten patients had managed to free themselves from their vehicles. “The most seriously injured patient was a woman who had suffered a suspected pelvic injury. She was immobilised with the use of a pelvic binder and taken to Royal Stoke University Hospital. “Two further patients, a man and a young boy, were taken to Royal Derby Hospital with minor chest and abdominal injuries respectively. “A woman and a young girl were taken were taken to Queens Hospital, Burton with minor injuries whilst a man was taken to the same hospital with minor chest injuries. Sunday 22nd November 2015 – 9.30pm – Jamie Arrowsmith. A man has been cut free from his car and sedated after suffering multiple serious injuries when a car and lorry collided tonight. It is the second serious incident on the same road within the space of 24 hours as West Midlands Ambulance Service was called to the A40 in Lea, Ross-on-Wye shortly before 6.40pm. As was the case with the previous night’s RTC, multiple resources were sent to the scene including two ambulances, a paramedic area support officer, a community paramedic, two BASICS doctors, a MERIT trauma doctor and the Midlands Air Ambulance crew from Strensham in a rapid response vehicle. A West Midlands Ambulance Service spokesman said: “On arrival, crews found a man, thought to be in his 20s, who was semi-conscious and trapped in his car following collision with a HGV. The car had suffered front end damage. “A rapid extrication took place due to the condition of the patient with crews working alongside the fire service to carefully cut him out of the car. “He was treated for multiple injuries including a serious head injury, a right arm fracture and fractures to both of his legs. He was also treated for a suspected pelvic injury. “The man, who was immobilised, was also anaesthetised in order to stabilise his condition before being alerted in to Queen Elizabeth Hospital, Birmingham. “Unfortunately, the man’s injuries are thought to be extremely serious. Sunday 22nd November 2015 – 8.15am – Chris Kowalik. The driver of this car (pictured), a man in his thirties, had a minor injury and refused hospital treatment. West Midlands Ambulance Service was called to Willenhall Road, Wolverhampton shortly before 1.20am today. A paramedic area support officer and an ambulance crew attended. There was a second car involved in the collision. Its driver wasn’t hurt. The picture shows a car that had hit a wall and overturned; its engine ripped out. There were four men inside, all in their twenties. West Midlands Ambulance Service was called to the scene, in Brickyard Road, Aldridge shortly after 2.15am today. Two ambulance crews and a paramedic area support officer attended. A West Midlands Ambulance Service spokesman said: “One man had a cut to his head, another had back and neck pain. Following treatments at the scene they were both taken to Walsall Manor Hospital. Sunday 22nd November 2015 – 7.45am – Chris Kowalik. A man has been taken to a major trauma centre after he collided with two cars in Herefordshire. West Midlands Ambulance Service was called to the A40 at Weston under Penyard shortly before 10.15pm onSaturday 21st November. A community first responder, an ambulance crew and a paramedic area support offer initially attended the scene. A West Midlands Ambulance Service spokesman said: “The pedestrian, a man who is believed to be in his thirties, had head, chest and abdominal injuries. Following initial assessment and treatment at the scene, the ambulance crew took him to Ross-on-Wye to a rendez-vous point with a British Association for Immediate Care (BASICS) doctor. It was to this location that the West Midlands Ambulance Service Medical Emergency Response Incident Team (MERIT) consisting of a trauma doctor and critical care practitioner was to arrive a short while later. “The BASICS doctor who was from the Mercia Accident Rescue Service (MARS) performed his own examination and found he needed anaesthetic. When the MERIT team arrived, they have him a general anaesthetic, maintained his airway and accompanied the ambulance crew as they took him to the major trauma centre at Queen Elizabeth Hospital Birmingham. Malcolm Russell was the BASICS Doctor who attended from the Mercia Accident Rescue Service. He said: “This is a good example of why we now have the MERIT team and a major trauma network that integrates with schemes such as MARS. It meant the man had the best integrated care from everyone from the CFR, through the ambulance crews to the specialities of MARS and MERIT and was taken directly to the major trauma centre; the right place for definitive care. Two years ago, this would not have been possible. Saturday 21st November 2015 – 9.20pm – Chris Kowalik. A woman has died following a collision with two cars. West Midlands Ambulance Service was called to Worcester Road, Holt Heath near the Top Barn activity centre. An advanced community paramedic in a rapid response vehicle, a paramedic area support officer in a rapid response vehicle and an ambulance crew attended. Saturday 21st November 2015 – 6.45am – Jamie Arrowsmith. A man has escaped with minor injuries despite being trapped in his car for about 30 minutes following a collision between his car and street furniture. The incident, which happened in Bilston Road, Ettinghsall, Wolverhampton, shortly before 3.30am this morning, caused considerable damage to the man’s car as well as roadside railings and a lamppost. West Midlands Ambulance Service sent an ambulance and a paramedic area support officer to the scene. A West Midlands Ambulance Service spokesman said: “On arrival crews discovered a lot of damage to the front end and windscreen of the car, as well as to railings and a lamppost. “There was one patient, a man who was the driver of the vehicle and thought to be in his 30s. “Following assessment from crews it became apparent that the man had been fortunate to escape with only minor injuries, including a minor head injury. “However, he still had to be cut free from the car and ambulance staff immobilised him prior to working closely with the fire service to get him out through the roof. “Once free he was transported to New Cross Hospital. A man has died following a collision between two motorbikes this afternoon. West Midlands Ambulance Service was called to the incident on the A5 in Tamworth, near to Ventura Retail Park, just before 3.15pm. An ambulance; a community paramedic in a rapid response vehicle and the Warwickshire and Northamptonshire Air Ambulance attended the scene. A West Midlands Ambulance Service spokesman said: “Crews were alerted to a collision involving two motorbikes in Tamworth. “A man was found to be in cardiac arrest. He was given advanced life support treatment by medics. Unfortunately, despite their best efforts the man was sadly confirmed dead at the scene. Friday 20th November 2015 – 3.30pm – Steve Parry. A cyclist has been airlifted to hospital following a road traffic collision on the B4197 at Martley near Worcester. West Midlands Ambulance Service was called to the incident at 2pm. An ambulance; a paramedic officer; a paramedic in a rapid response vehicle, together with the Midlands Air Ambulance from Cosford and Strensham, attended the scene. A West Midlands Ambulance Service spokesman said: “Crews responded to a collision between a car and cyclist near Worcester this afternoon. “Crews treated a man in his sixties for serious head injuries. “The patient was immobilised using a neck collar and spinal board. He was sedated by a doctor at the scene before being airlifted to the Queen Elizabeth Hospital in Birmingham for further assessment and treatment. “The hospital was alerted to the serious condition of the patient. Thursday 19th November 2015 – 8pm – Jamie Arrowsmith. A pedestrian who was found lying in the round has suffered a serious head injury following a collision with a car this evening. West Midlands Ambulance Service was called to the junction of Primrose Hill and Sisefield Road in Kings Norton, Birmingham, just before 5.20pm and sent an ambulance, a rapid response paramedic and a paramedic area support officer to the scene. A West Midlands Ambulance Service spokesman said: “Crews arrived to find a woman with a severely reduced level of consciousness lying in the road after what is believed to be a collision with a car. “The woman, thought to be in her 50s, was treated for a serious head injury and a wrist injury. “Ambulance staff worked hard to stabilise her condition before transporting her to Queen Elizabeth Hospital, Birmingham for further treatment. Thursday 19th November 2015 – 1.15pm – Steve Parry. A motorist has died in a road traffic collision south of Hereford this morning. West Midlands Ambulance Service was called to the incident on the A49 at Callow Hill at approximately 11am. An ambulance together with a paramedic officer in a rapid response vehicle attended the scene. A West Midlands Ambulance Service spokesman said: “Crews attended a road traffic collision involving a car and lorry. “Sadly, it quickly became apparent that nothing could be done to save the patient who was confirmed dead at the scene. Thursday 19th November 2015 – 9.45am – Steve Parry. A motorcyclist has escaped serious injury following a road traffic collision on the A439 Warwick Road in Stratford earlier today. West Midlands Ambulance Service was called to the incident at just before 8.20am. An ambulance together with a paramedic support officer in a rapid response vehicle attended the scene. A West Midlands Ambulance Service spokesman said: “Crews responded to a collision between a motorbike and car in Warwick Road this morning. “Crews treated a man in his forties for a slight chest injury. The rider was apparently thrown thirty feet from his machine on impact. Fortunately he was wearing full protective gear and according to Crews was extremely lucky not to have suffered serious injury. “The patient was immobilised using a neck collar and placed on an orthopaedic stretcher before being conveyed to the University Hospital Coventry and Warwickshire for further assessment and treatment. Thursday 19th November 2015 – 9.35am – Chris Kowalik. A man, described as a “walking example” that CPR and defibrillators do work, has met the ambulance crews who helped save his life. On Friday September 28th, 2012 shortly after his 17th birthday, Dan Edwards had run up stairs at Worcester College of Technology to get his coat for a hospital appointment when he collapsed and suffered a cardiac arrest. A member of college staff who saw it happen put him in the recovery position and called for his tutor, former Engineering Supervisor Dave Price who was also a Community First Responder to come up and help. Dave ran up the stairs, started CPR and continued even after the ambulance service arrived. Dan has made a full recovery and has met Dave since, but last Friday 13th November was an opportunity for Dan and his family to also meet the ambulance crews involved in the case. Dan was taken to Worcestershire Royal Hospital where he was in a coma until the following Monday, October 1st. Dan, his friends and his mother Sue have had training in CPR and using a defibrillator. Sue said: “We didn’t want to think if we saw something like that in the street that we would have to walk by because we couldn’t help. I would like to think that we can at least try and save somebody and know what to do. So, we both went on the course. It’s so important. Dan is a walking example that hands-on CPR and defibrillators do work”. Dan father Darren added: “Dan’s family would like to say thank you so much to everyone involved in saving Daniel’s life and we will always be grateful for what they did that day”. Wednesday 4th November 2015 – 9.30pm – Jamie Arrowsmith. A woman was trapped in her car for an hour before eventually being cut free through the roof following a three-vehicle collision this afternoon. Two cars and a van were involved in the incident which resulted in the woman’s car spinning nearly 360 degrees. West Midlands Ambulance Service received a call to Bromsgrove Road in Hunnington, Halesowen, at 4.20pm and sent two ambulances, a paramedic area support officer and the Midlands Air Ambulance crew from Strensham, in a rapid response vehicle, to the scene. A West Midlands Ambulance Service spokesman said: “On arrival, crews discovered a woman who was trapped in her car which had suffered front and rear end damage. “The woman, believed to be in her 40s, was assessed and treated for a knee injury, a suspected hip injury and a suspected fractured collarbone. “She was immobilised prior to being cut free from the vehicle and had a pelvic binder applied as well as being given pain relief. “Once out of the car she was taken to Queen Elizabeth Hospital, Birmingham. “The second car, which had front end damage, contained a man and a woman, both thought to be in their 60s. “The woman, a passenger, managed to free herself and was treated for minor injuries before being taken to the same hospital. If used, please credit the images to West Midlands Ambulance Service. Wednesday 18th November 2015 – 8.55pm – Jamie Arrowsmith. A woman has died following a house fire in Birmingham this afternoon. The incident occurred in a residential property on the B4128 in Bordesley Green, shortly before 4pm. An ambulance and a paramedic area support officer attended the scene. A West Midlands Ambulance Service spokesman said: “Crews arrived to find a woman that had been rescued from the property by the fire service who were carrying out CPR. “Medics took over resuscitation attempts but unfortunately, despite everyone’s best efforts, nothing could be done to save her and sadly she was confirmed dead at the scene. 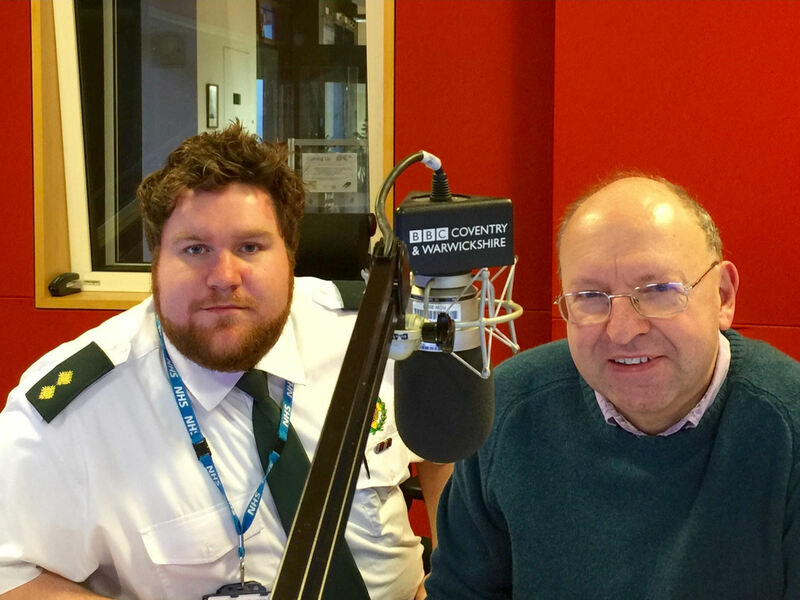 The above words were spoken by paramedic Andy Allsopp as he re-lived when he was attacked by a member of the public. Since we told you about a 30% rise in physical assaults on our staff, you’ve shown your support for our staff by expressing your incredulity at why people would attack them when all they are trying to do is help someone in their hour of need. Wednesday 18th November 2015 – 6.15pm – Jamie Arrowsmith. Two men have died and a third has been seriously injured following a collision between two cars and a lorry this afternoon. The incident occurred on the B4510 in Middle Littleton, Worcester, shortly before 2.25pm. West Midlands Ambulance Service sent an ambulance, a paramedic area support officer, a paramedic in a rapid response vehicle and the Midlands Air Ambulances from Cosford and Strensham to the scene. A West Midlands Ambulance Service spokesman said: “Crews arrived to find three men who had all been ejected from their car. “Ambulance staff were told it followed a collision between the car and a lorry. “Unfortunately it quickly became apparent that nothing could be done to save two of the men and they were confirmed dead at the scene. “The third man, thought to be in his 30s, was assessed and treated for a serious head injury and a suspected leg fracture. “He was suffering from a reduced level of consciousness and was anaesthetised at the scene. “Once his condition had been stabilised he was airlifted to Queen Elizabeth Hospital, Birmingham, for further treatment. “A second car had suffered minor damage in the incident and the driver, a woman, was treated for an injury to her nose before being discharged on scene. Wednesday, 18th November 2015 – 4.25pm – Jamie Arrowsmith. A motorcyclist has died following a road traffic collision with a coach in Stratford-upon-Avon this afternoon. West Midlands Ambulance Service was called to Warwick Road, near to Stratford Manor Hotel, shortly after 2pm and sent an ambulance and a paramedic in a rapid response vehicle to the scene. A West Midlands Ambulance Service spokesman said: “Crews arrived to find a man who is believed to have fallen from his motorbike and collided with a coach. “He had suffered a serious head injury and was in cardiac arrest. “Bystanders had already started CPR on the man before ambulance staff took over and continued advanced life support. “Unfortunately, it quickly became apparent that nothing could be done to save him and he was confirmed dead at the scene. We have no more details on this incident. Tuesday, 17th November 2015 – 8.15pm – Jamie Arrowsmith. Two car drivers, one of whom has been seriously injured, had to be cut free from their cars following a road traffic collision this evening. The collision, which took place in Guarlford Road in Malvern shortly before 5.15pm, left the two men trapped as a result of their injuries and the damage sustained to their vehicles. West Midlands Ambulance Service sent two ambulances, a paramedic in a rapid response vehicle, a paramedic area support officer and the Midlands Air Ambulance crew from Strensham, in a rapid response vehicle, to the scene. A West Midlands Ambulance Service spokesman said: “On arrival, crews discovered two cars, both of which had suffered front end damage and both with their drivers trapped inside. “Ambulance staff assessed both patients before working alongside the fire service to carefully cut them out of their cars. “The first man, thought to be in his 20s, was suffering from a reduced level of consciousness and was also treated for a significant lower leg injury, arm injury and a suspected pelvic injury. “He was immobilised with the use of a neck collar and scoop stretcher, given pain relief and taken to Queen Elizabeth Hospital, Birmingham. The Air Ambulance doctor travelled on the back of the ambulance to continue treatment en-route. Tuesday 17th November 2015 – 4.50pm – John Hawker. The driver of a car has been injured after a domino effect RTC on the M42 this morning. The crash occurred at around 9.20am near junction 8 southbound. An ambulance and a paramedic officer attended the incident. A West Midlands Ambulance Service spokesman said: “Crews arrived to find a car, a van and a lorry that had been in a collision. “The driver of the car, which was at the rear of the crash, suffered significant bruising to his pelvic and abdominal area. The man, believed to be in his 80’s, received emergency treatment at the scene from medics and his condition was stabilised. “Following treatment, the man was transferred by ambulance to Heartlands Hospital for further treatment. Tuesday 17th November 2015 – 3.40pm – John Hawker. A man has been rescued after sliding down a steep slope and falling into a canal in Birmingham, breaking his leg in the process. Ambulance crews were called to a canal near Rolfe Street Railway Station, Smethwick at around 9.45am this morning. A West Midlands Ambulance Service spokesman said: “Crews arrived to find the man had managed to drag himself out of the water and on to a canal barge, despite his seriously injured leg. “Ambulance crews worked with the fire service to gain access to the patient who was on the boat on the other side of the canal, which was inaccessible. “After gaining access to the barge, the patient received emergency treatment by medics including receiving pain relief and having a leg splint fitted. The boat was moved then back over to the accessible side of the canal with the patient on it. “The man in his 30’s, was then carried along the canal tow path and up to the awaiting ambulance nearby. In total the rescue operation took around an hour. “Ambulance medics worked seamlessly with the fire service to ensure the man received the best treatment and was rescued as quickly and safely as possible. Tuesday 17th November 2015 – 3.30pm – John Hawker. Ten patients were assessed by medics at a school in Kidderminster this morning following reports of a chemical incident. West Midlands Ambulance Service was called to Holy Trinity School, Birmingham Road at around 11.30am to reports of a number of pupils and a staff member feeling unwell. A West Midlands Ambulance Service spokesman said: “The school was evacuated after a number of pupils reported feeling nauseous and having sore throats. “Nine pupils, all aged between 12 and 16, and also a staff member from the school were assessed by medics. Following assessment they were all discharged and did not require further treatment. “The Trust dispatched two ambulances, a paramedic officer and the Trusts Hazardous Area Response Team to the scene. The Fire Service were also in attendance. Monday 16th November – 12.00am – Claire Brown. A man has escaped serious injury after the lorry he was driving ended up on its side on a motorway this morning. West Midlands Ambulance Service was called to the northbound carriageway of the M6 just past Junction 4 in Coleshill shortly before 10.00am (Monday). An ambulance and Paramedic Area Support Officer Steve Hargreaves, who tweeted a photo of the overturned lorry, attended the scene. A West Midlands Ambulance Service spokeswoman said: “The lorry had ended up on its drivers’ side blocking the hard shoulder, inside and middle lanes of the motorway. “Thankfully the driver, a man in his 50s, had managed to get out of the cab. Upon assessment, ambulance staff found he had sustained an elbow injury in the incident. He was given pain relief before being taken to Heartlands Hospital for further assessment and treatment. Monday 16th November 2015 – 10.45am – Claire Brown. A man has been airlifted to a major trauma centre following a collision involving two cars and a lorry in Shropshire this morning. West Midlands Ambulance Service was called to the A49 about ½ mile from the Condover turning at 8.15am this morning (Monday). Two ambulances, a paramedic area support officer and the Midlands Air Ambulance from Cosford with a MERIT trauma doctor on board attended the scene. A West Midlands Ambulance Service spokeswoman said: “Two cars and a lorry had been involved in a collision when emergency services arrived on scene. “The driver of one car, a 45-year-old man, was trapped inside but was fully conscious and breathing. Whilst the fire service worked around ambulance staff to release the man from the wreckage, the medical team assessed him and found he had sustained a chest injury, a fractured wrist and suspected pelvic injuries. “The man was given oxygen and an anti-haemorrhage drug to stabilise his condition before he was carefully lifted out of the car by fire and ambulance staff onto a spinal board. His arm was splinted and he was also placed in a neck collar before being airlifted to Royal Stoke University Hospital for further assessment and treatment. Monday 16th November 2015 – 9.35am – Murray MacGregor. Kicked, punched, spat at, had knife pointed at them, threatened with death. This is just a few of the experiences frontline ambulance staff have had to put up with over the last 6 months in the West Midlands. New figures which were revealed at the Trust’s Board meeting show that for the first six months of the year (April – September), the number of physical assaults on staff rose by almost 30% to a disgusting 139 incidents. The number of verbal assaults also rose, by 13% to 246 incidents reported. Based on the appalling statistics, Trust Chief Executive Anthony Marsh is to write to the Chairs of Magistrates Benches across the Region asking them to take the toughest possible action against members of the public who assault Trust staff. Mr Marsh, said: “It is quite outrageous that our staff are having to put up with such violence. The Board is determined that we should do everything possible to protect our staff. Regional Security Manager, Steve Elliker, said: “The penalties handed down are simply not sufficient to deter people currently. We need sentences to be a deterrent so that people think twice before they attack our staff. “The fact that some of our staff do not report cases of violence because they do not believe that enough action will be taken against the perpetrator is a sad reflection on how they feel. Last year, we highlighted the issue and produced these videos. Sadly, the situation is just as bad today as it was then. Sunday 15th November 2015 – 6.00am – John Hawker. A pedestrian has suffered head injuries after an RTC in Birmingham last night. A West Midlands Ambulance Service spokesman said: “Crews arrived to find a man who had suffered head and chest injuries after being struck by a car. “The man, believed to be in his 30’s, received advanced trauma care at the scene from medics and his condition was stabilised. “He was then transferred by ambulance to Heartlands Hospital for further assessment and emergency treatment. An ambulance, a paramedic officer and the CARE team attended the incident in Coventry Road, Small Heath at around 8.15pm.